Lisa Colozza Cocca will be one of the 20 authors speaking at the Morristown Festival of Books on Saturday, September 27. Ms. Cocca will speak and answer questions for an hour and then be available for book signing. Planning is underway for an in-depth panel discussion on the themes addressed in the book, after the author presentation. Ms. Cocca is a freelance writer and editor in educational publishing. She grew up in Cohoes, New York and has called New Jersey home for more than thirty years. Lisa is the author of numerous nonfiction titles for children and young adults, including Reconstruction and the Aftermath of the Civil War, Marquis de Lafayette: Fighting for America’s Freedom, and the Understanding Graphs series. When the sun goes down, Lisa is back at the computer writing. She is most excited about her debut young adult novel, Providence. 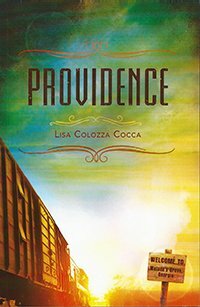 Providence touches on loss and abandonment, the challenges of the elderly and keeping small communities vibrant. It appeals to a diverse readership with a broad appeal to all ages of readers. One Community, One Book is a special event, with participating communities throughout the county joining together over the summer to read the same book. The Morristown Festival of Books’ One Community, One Book event with Ms. Cocca is free of charge.